Fusion Diamond 41 is Fusion Chess variant on a 41 square diamond shaped board. The idea for a diamond shaped board was borrowed from Diamond Chess by Bruce Mills. Fusion Diamond 41 was created by Fergus Duniho, the creator of Fusion Chess, as an entry in the 41 Squares Contest. Many small Chess variants are plagued by congestion. It becomes very hard to move the pieces around. The features of Fusion Diamond 41 are designed to reduce congestion. The shape of the board covers where most of the action would be on a 9x9 board. The Berolina Pawns work better on a diamond shaped board, and their greater mobility lets them get out of the way more easily. The ability to join and split pieces provides pieces with more options for movement, and it also allows for an interesting variety of pieces on a small board. 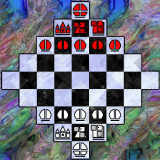 Fusion Chess, which this game is based on, is a Chess variant in which pieces may merge together or split apart. In some philosophical inquiries into personal identity, fusion is the process whereby two individuals merge together as a single individual, and fission is the process whereby a single individual divides into two people. Fusion Chess borrows these concepts of fusion and fission from personal identity theory and applies them to Chess pieces. A compound piece may split into its components by moving one of its components, under its own powers of movement, to an empty square. Berolina Pawns are used in place of regular Pawns. Berolina Pawns capture straight forward and move diagonally forward. Pawns may not make a double move or capture en passant. Pawns promote on the second-to-last rank. Pawns may promote to Rook, Bishop, or Knight, but not to any compound piece. Pope The Pope moves as a King or Bishop, but may not move into check. The Pope is a royal piece and is formed when a King merges with a neighboring Bishop. When the Pope is on the board, it is the player's only royal piece, and the game is lost if it is checkmated. The Pope may split into its components by making a non-capturing move with one of them. Dragon King The Dragon King moves as a King or Rook, but may not move into check. The Dragon King is a royal piece and is formed when a King merges with a neighboring Rook. When the Dragon King is on the board, it is the player's only royal piece, and the game is lost if it is checkmated. The Dragon King may split into its components by making a non-capturing move with one of them. The name for this piece is borrowed from Shogi. Eques Rex The Eques Rex moves as a King or Knight, but may not move into check. The Eques Rex is a royal piece and is formed when a King merges with a neighboring Knight. When the Eques Rex is on the board, it is the player's only royal piece, and the game is lost if it is checkmated. The Eques Rex may split into its components by making a non-capturing move with one of them. The name is Latin for Cavalier King. Berolina Pawn The Berolina Pawn captures by moving one space orthogonally forward, and it moves without capturing by moving one space diagonally forward. Although the Berolina Pawn normally has a double move, it does not in this game. There is also no en passant in this game. When a Berolina Pawn reaches the second-to-last rank, it may promote to a Rook, Bishop, or Knight. It may not promote to a Queen, Marshall, or Paladin. You can play this game with the pieces from a regular Chess set, a Gothic Chess set, or a Grand Chess set. If you use a regular Chess set, you should use a pair of pieces to represent each compound piece. One regular Chess set will have all the pieces you need for this. Sets for Gothic Chess and Grand Chess come with additional pieces that represent all the non-royal compound pieces in this game. But you would still have to use pairs of pieces for the royal compound pieces. You can make the board by tiling together poster board tiles or sections cut from a Chess board. Or you could draw the board on a sheet of paper. Use algebraic notation as you would for Chess. Use P to denote Paladin and M to denote Marshall. Denote Berolina Pawn moves without the use of any letter to identify it. When a piece merges with another piece, follow the move with = and the abbreviation for the new piece. For example, R c4 - d4 = M indicates that a Rook moved from c4 to d4 and merged with a Knight on d4 to form a Marshall. When a piece separates from a compound piece, identify the move as belonging to the piece which moves away from the compound piece. Follow its move with a semicolon and identify what piece is left behind. For example, R c4 - d4; c4 = N indicates that a Rook separated from a Marshall at c4, moved to d4, and left behind a Knight at c4. If you have Zillions of Games, you can play Fusion Diamond 41 on your computer. On March 31, 2001, the zrf was updated to use the board shown on your left. Sound effects were also updated.